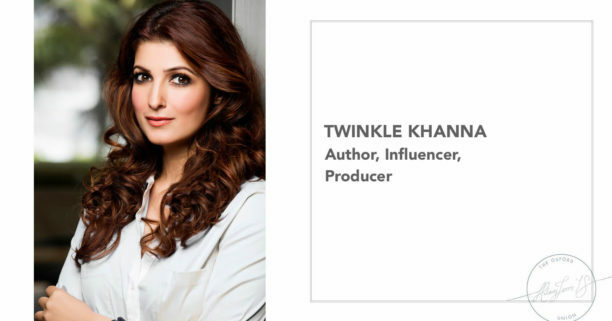 Twinkle Khanna, India’s bestselling female author, film producer, woman’s rights activist, interior design entrepreneur, and former actress, has been invited to speak at The Oxford Union, the world’s most prestigious debating society, at 5pm on Thursday 18th January. Twinkle Khanna is popularly known as Mrs Funnybones, also the title of her first book and her column in the Sunday Times of India. Her first book Mrs Funnybones sold over 100,000 copies, making her the highest-selling female author in India and her second book, The Legend of Lakshmi Prasad, featured a collection of short stories, debuting at number two on Amazon India’s bestseller list. One of the stories, Salaam, Noni Appa, has been adapted for a stage production and another story about a man who invented a machine to make low-cost sanitary pads had cinematic potential, so Twinkle Khanna turned producer to develop it for the big screen. The result is her latest endeavour, Pad Man, the world’s first feature film on menstrual hygiene, based on the life of social entrepreneur and activist Arunachalam Muruganantham, who revolutionised sanitary hygiene in rural India 20 years ago. At The Oxford Union, Twinkle Khanna is set to explain why it is important the world knows about Pad Man’s story, the imperative need to spotlight issues relating to menstrual hygiene, tackling taboos and breaking down the stigma attached to periods globally as a means to empower girls and women worldwide, and how movies have the potential to become movements. Pad Man will become the first Indian film to be promoted at The Oxford Union, presenting a milestone for Indian cinema. Releasing in cinemas worldwide on 25th January, the film Pad Man traces Arunachalam Muruganantham’s international journey from an outcast exiled from society for his endeavours to delve into such a taboo subject, to becoming a super-hero of India’s modern history, as he followed his dream to bring a revolution to menstrual hygiene in India. Pad Man is nothing short of an impulsive, flamboyant and driven entrepreneur extraordinaire, who refused to give up in the wake of scrutiny and ridicule, using his resilience and initiative to invent India’s low cost sanitary napkin making machine. An extreme enigma in his home town, Arunachalam Muruganantham’s super-heroic efforts led to a business that today employs hundreds of women across India. Dubbed ‘Superhero hai yeh Pagla’, Pad Man is the world’s first feature film on menstrual hygiene inspired by the story of TIME Magazine’s 100 Most Influential entrants ArunachalamMuruganantham, a rural welder from India with a unique, eccentrically mad edge who turned incredible inventor by providing women with access to high-quality and affordable sanitary pads 20 years ago. Produced by Aruna Bhatia, Mrs Funnybones Movies, SPE FIlms India, Kriarj Entertainment, Cape of Good Films and Hope Productions, Pad Man is written and directed by ad-man turned film-man R Balki (Paa). It is billed as the most progressive family entertainer yet, starring international megastar Akshay Kumar (Toilet: Ek Prem Katha) who assumes the titular role of Arunachalam Muruganantham to once again showcase his commitment to social entertainers. He is joined by critically acclaimed actresses Sonam Kapoor (Neerja) and Radhika Apte (Kabali). Twinkle Khanna will be speaking at The Oxford Union at 5pm on Thursday 18th January. Pad Man releases in cinemas worldwide on the 26th January to inspire all the cape-less heroes amongst us, through SPE Films, India.